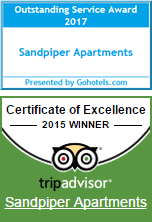 Few Broadbeach resorts on the Gold Coast can boast the absolute beachfront location that the Sandpiper Apartments occupies on Broadbeach. With a full complement of features, our modern one and two bedroom fully contained apartments will leave you with very little wanting for your accommodation. All apartments have panoramic views of the ocean with spacious interiors as well. The included breakfast balconies are perfect for al fresco dining. Amenities also include; a separate bathroom with shower, digital TV and Foxtel, hairdryer, Wi-Fi, ironing board and iron, microwave and fridge/freezer to make you feel right at home. Our Broadbeach resort amenities are top notch too. 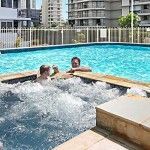 Here at Broadbeach’s Sandpiper Apartments the pool area is a fun place to hang out and there is enough space in the courtyard for the adults to enjoy their island of calm sipping a cool drink beside the pool. There’s lots to keep you in Broadbeach on the Gold Coast. 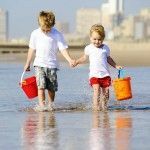 Families can feel safe to enjoy the expansive parklands that form a strip between the Esplanade and beach. In front of our Broadbeach apartment resort is a wonderful area of park with a children’s playground, bicycle and walking tracks, and public barbeque area. Just beyond this parkland strip lies the Broadbeach beach, complete with Lifeguard stations. For your peace of mind this part of the coast is fully patrolled. More water confident holidaymakers can try their hand at surfing. The Broadbeach Surf School gives everyone the opportunity to experience surfing and lifestyle benefits. They cater for beginners to advanced surfers and teach surf safety and awareness with qualified surfing instructors. All equipment is supplied, and you’re taken to the best available surfing area on the day. If you prefer to keep your powder dry, there’s some handy shopping to be had at the Oasis Shopping Centre just around the corner. A short ride away is Harbourtown Shopping Centre, Queenslands biggest brand outlet complex. Dress your home and your family in designer brands at discount prices. For large retail malls, Australia Fair and Pacific Fair are hard to beat. There aren’t that many Broadbeach resorts on the Gold Coast that provide holiday makers with all these services and amenities in such a concentrated area. Just bring your family, mix, and enjoy.